← The universe is at it again. I spent the morning watching my new little buddy wander aimlessly across my ceiling, circling and stopping at what I can only assume is a spidey stop sign. Apparently he had a busy Monday morning, lots to get done. He wasn’t my last visitor today, because when I stumbled groggily into my kitchen to open the blind, alas, another one of the eight-legged brotherhood had set up camp in the folds. The window is going to stay closed for a bit. You see, I don’t kill spiders, and apparently the word is out. They are everywhere, my constant companions. I leave them be, and in return they avoid me. The only exception to this policy was the black widow that dropped off the ceiling directly into my wash machine full of clothes. I considered that an act of war, so she was immediately heavy washed in hot water with an extra rinse cycle. She forgot rule #1: Leave me alone. She paid the ultimate price. 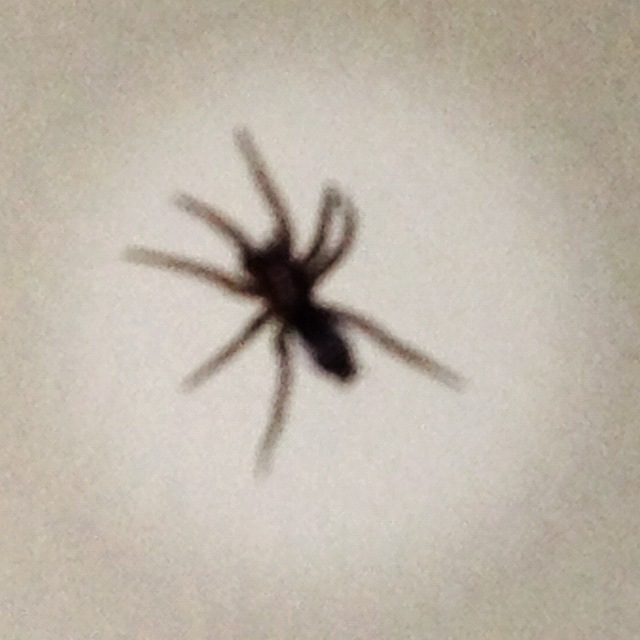 I don’t spare spiders out of any karmic duty or Buddhist belief. Actually, the Buddhist belief that all life is sacred is pretty appealing to me, except for one small exception. I get a twisted satisfaction watching ant s feast on Terro, like a little flock of Kool-Aid drinkers and I am Jim Jones reincarnate. Creeps me out how much I hate the little guys, but again, they declared war first. At this point you may feel compelled to remind me that we encroach on animals natural habitats, then blame them for trouble. Don’t. Save that argument for more worthy animals, like ANY other animal besides ants. I read somewhere once, that spiders were good for the environment, and that has stuck with me. I think they eat other pest insects, which I find appealing since I grew up where mosquitoes are the size of condors. I also like spiders because no one else does. I am a sucker for the underdog, the down-and-out, the lepers of the world. Until today, I have been OK with my decision to not kill spiders, but things are starting to get a little out of control at my house. It’s like projectX was posted on BugBook and my life is never going to be the same. Spiders, ants, mice, you name it, they got the event invitation. You can read about my mouse party here. I think it’s time to burn the house down. I’m with you in that I avoid killing spiders and I set free the helpless lizards and grass hopers that my cats bring. But I do not share this same courtesy with ants. In my opinion, they deserve to die. I can’t hand them. I use Chinese Chalk to deal with my ant problem. Although I was just told it is illegal. Whatever, it’s the only thing that works. Haven’t heard of Chinese Chalk – have you been on the black market again?? If you need a good, legal alternative, Terra is AMAZING. My husband is a no-kill spider person, but I’m all about grabbing the heaviest item nearby and smashing the to bits. However, this doesn’t stop other creatures– they see my house as the ultimate challenge. I do applaud your kindness to them! I wasn’t always so kind – my evolution started with pansy screamer, through rolled magazine assassin, and now this strange new space of tolerance. As you can see, I’m quickly losing patience. And I have a stack of old People’s – arsenal perhaps for the moment I break?